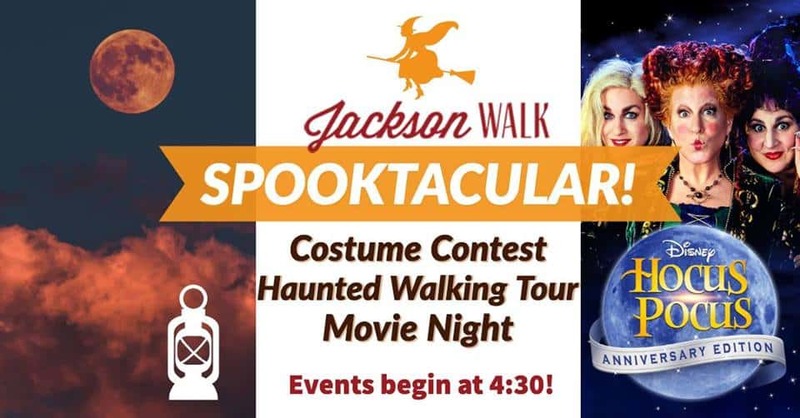 Come out and enjoy a Spooktacular evening in Downtown Jackson of ghost stories, costumes, food trucks, and the infamous Sanderson Sisters! On October 13th at Hosted by Jackson Walk Apartments! There will be a costume contest for all ages! A Haunted Walking Tour with storytelling, and a very special Halloween movie night at the AMP Featuring Hocus Pocus! Food trucks with sweet treats will be available throughout the evening! Costume Contest -4:30PM at Farmers Market. Hocus Pocus -7:00 PM at the AMP!